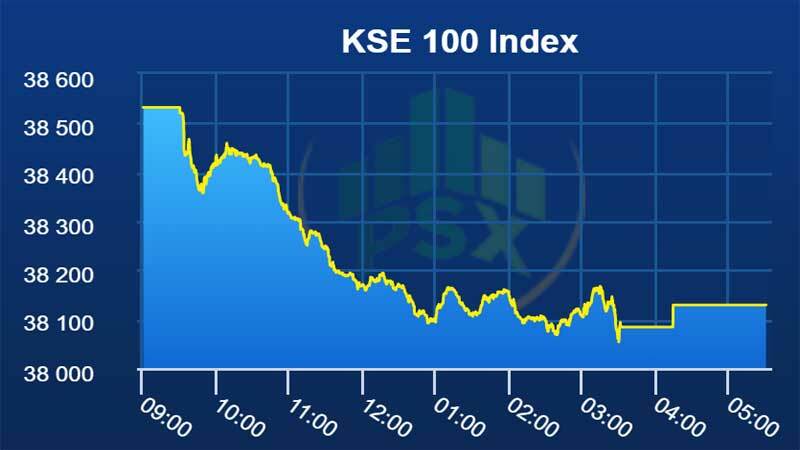 The KSE-100 shed 403 points on Monday to close at 38,129 levels, down 1 percent, as pressure was seen in the market due to roll-over week. An equity analyst at Trust Securities said the benchmark KSE-100 index opened the weeks first trading session 11 points in the “red zone” and went on to make a low of 478 points taking the index to a level of 38,053, but similar to the past few trading sessions the market kept fluctuating, However, even though the index fluctuation took place the market maintained its position in the “red zone”, economic constraints being a main reason for this and as the trading session came to an end the index showed minimal recovery in points and went on to close off at a level of 38,083(-448points) in the “red”. The cement sector took as Lucky Cement losing 2.8 percent, DG Kahn Cement (DGKC) losing 3.5 percent and Fauji Cement Company Limited (FCCL) losing 0.9 percent closed in the red. Moreover, the National Fertilizer Development Center (NFDC) announced Fertilizer off-take for February-2019 where strong demand kept urea off-take afloat with closing inventory recorded at 54000 tons. ENGRO (-1.0%) and FFC (-0.7%) closed in the negative zone due to the overall pressure in the market. From the banking space, National Bank of Pakistan (NBP) losing 0.8 percent and United Bank limited (UBL) losing 0.2 percent closed in the red zone where as MCB Bank gaining 0.1 percent closed positive. Pakistn Suzuki Motor Company (PSMC) from the Auto sector, closed limit down as the company reported 2018 EPS of Rs15.77, and a cash payout of Rs3.16/share. Oil Gas Development Company (OGDC), LUCK (-2.8%), Pakistan Petroleum Limited (PPL) (-1.3%), Pakistan Oil Fields (POL) (-1.9%), ENGRO (-1.0%), Engro Fertilizer (-2.2%), DGKC (-3.5%) and FFC (-0.7%) cumulatively contributed -186 points to the negative closing. Daily traded value stood at $19 million (down 40 percent) while volume was recorded at 56 million shares (down 33 percent). Furthermore, major contribution to total market volume came from K-Electric (-4.4%), WTL (-5.3%), BOP (-0.5%) and OGDC (-1.7%). On the news front, the Financial Action Task Force (FATF) delegation arrived in Islamabad today to assess Pakistan’s progress on combating money laundering. Furthermore, State Bank of Pakistan is to announce its monetary policy this week. Market performance is expected to remain likewise until further clarity on an IMF program. An equity analyst Danish Ladhani recommends staying cautious in the short run due to risk of further monetary tightening, inflationary pressure and the rollover week.